Today is reveal day at Write. Click. Scrapbook. This month's theme is Pinterest Made Me Do It. 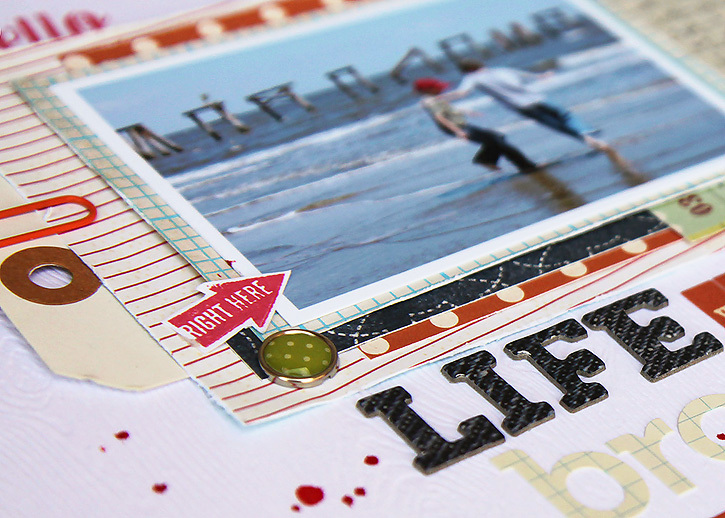 Be sure to check out all the wonderful layouts inspired by Pinterest in this month's gallery. I enjoyed perusing my pinterest scrapbook boards deciding what to make! 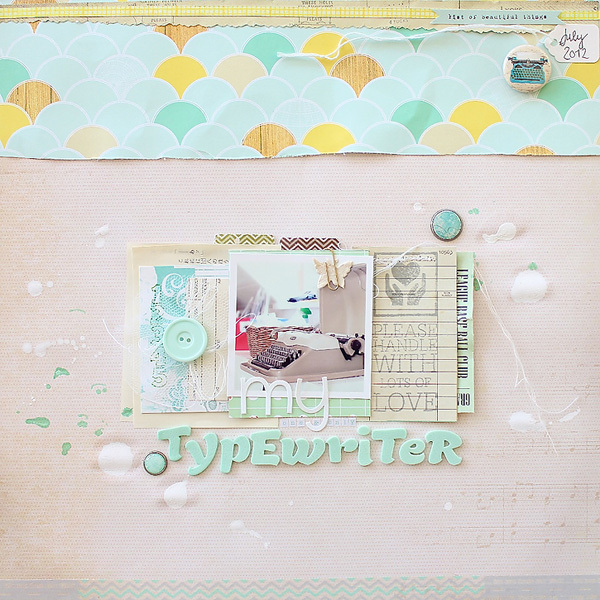 I decided to go with this amazing layout by Janna Werner. I love her messy, beautiful style. My layout is about a wonderful day back in February 2006. The boys had the day off from school for Mardi Gras. We decided to make the drive all the way down to the Louisiana coast. I only live 60 miles from the Gulf of Mexico as the crow flies, but it takes 3.5 hours to get there by car. Louisiana's coast is mostly swamp and marsh. It's not your typical beach and there are no beach resorts in Louisiana (we go to the Florida beaches for that). My whole life I've heard of an island just off the coast in Louisiana called Grand Isle. It's a small town with lots of fishermen and fishing camps. I wanted to see it! We spent the day exploring and walked on the beach, my first time to ever walk on the Louisiana beach and I've lived here my entire life. The water isn't very pretty due to the proximity to the Mississippi River. Actually, it's more brown like the river than blue like the ocean, but it was a fun day and I'm glad we all got to experience it! I used bolder colors, but I distressed the edges of my papers and tried to crinkle them up a little and I even used a bit of Mister Huey's Mist in Real Red to add some splotches of paint. I included extra journaling about our day on the tag. Thanks, Janna for the inspiration for my layout! 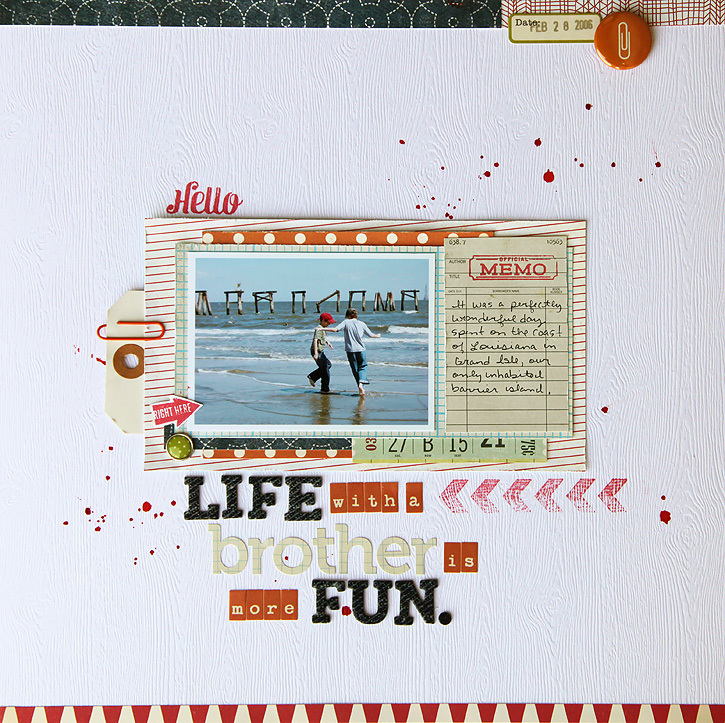 Check out more of Janna's amazing work on her blog. It looks wonderful!! Love the memories from the day! Love it and Jennas style. I've been wanting to lift one of her LO's and give her style a try. Your LO is awesome. Great page Deb! I really like the look of the wood grain paper you used for the background, may have to try some of that. Great colors (red is my favorite color), & I like the various lettering for the title, too! It went into my Memory Keeping folder on Pinterest! 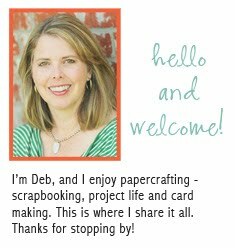 Deb - i love the "brother" layout but especially love that white cardstock w/texture..can you share who makes it/where you found it? I'd love a great big stash of it. :) Thanks!! You can click on the notify button and they will email you when it's back in stock.